We had a fabulous day last weekend walking up in the Ochil Hills near Stirling. 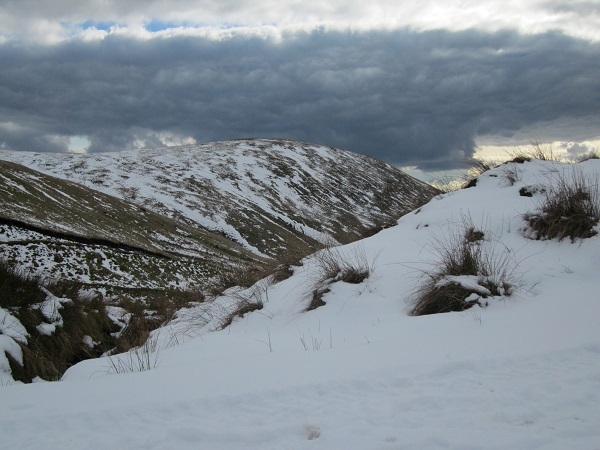 We visit these hills most years at some point and they make a great short winter day ….as we experienced on Saturday. We weren’t planning to go far as once again Nita had to work a 12 hour shift at the hospital the following day so we decided to walk up onto Craighorn, the 583 metre high top that we returned over on our last visit to this area. As we drove over towards the Ochil’s it certainly looked like being a very fine day with clear blue skies and stunning early morning colours and as we got closer Nita said she could make out a little snow on the upper slopes ….but not much. 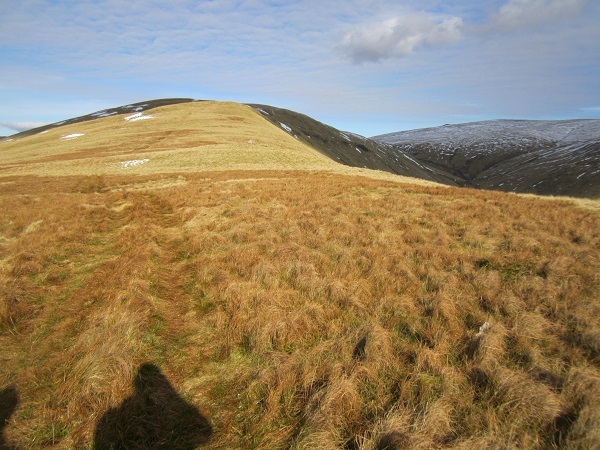 We started walking from the small car park near Alva and were soon far too hot as we plodded up the steep twisting estate track that climbs up towards The Nebbit……it was the perfect early spring day. The track splits after the initial steep bit and we took the one that contours around the side of The Nebbit and above the impressive Alva Glen with it’s even more impressive gorge……it looked beautiful in the bright sunshine. Once beyond The Nebbit we left the path and headed straight up the front of Craighorn on steep but very pleasant grassy slopes. This was quite hard going in the warm sun and jumpers, jackets and hats were being stripped off in order to keep reasonably cool…..I was even worrying about not having any sun-block for my head! We gained height fairly quickly and as we did, the views opened up. Looking south we could see the big sweeping lines of the Forth and off to our right, considerably more snow than we’d anticipated from the road side view earlier. It was still nice and warm though and with the shelter given by the near by hills, there was very little in the way of wind. We sat down and enjoyed the warm sun, the great views and the peace and quiet. As the steep slopes gave way to the broad gradually rising ridge of Craighorn however, we finally found the wind and saw the extent of the snow over on Ben Ever and Ben Cleuch …it was really quite white and I was already thinking about putting the jumper back on ….but while we kept going, it was fine. 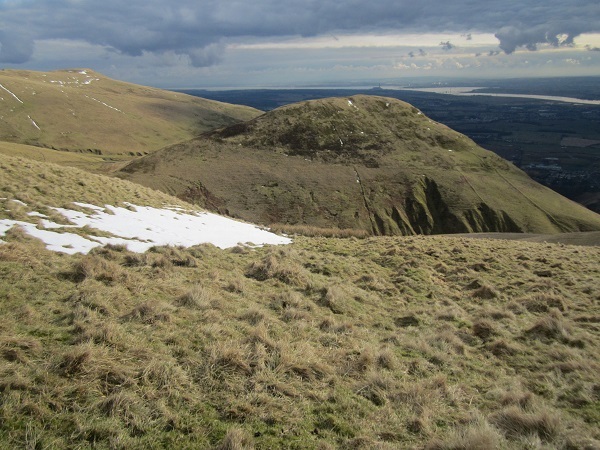 By this stage we must have been above 500 metres and although there was an occasional patch of snow, it was still mainly open grass ….and it appeared to be like this all the way up the final slopes. 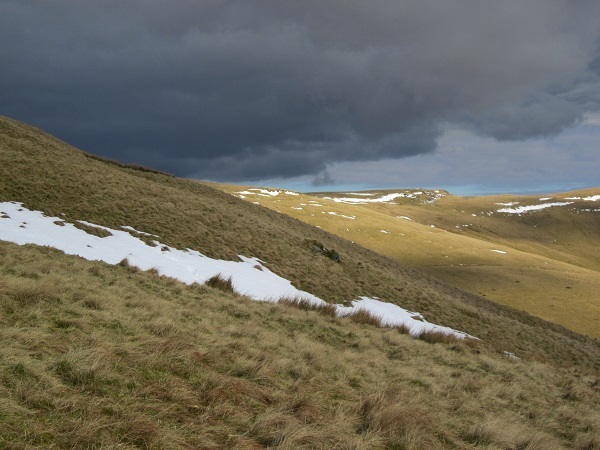 Then, within just a few metres of both ascent and distance, what had been a pleasant early spring day, turned into winter! Suddenly there was quite a lot of snow around. It was still quite thick in places and icy too …… and the temperature seemed to suddenly have plummeted. In all honesty this was more down to the fact that as we had been walking, dark heavy clouds had appeared and the wind had picked up considerably too. We had a mad dash to get all our warm gear on ….and then we were fine! Even having walked the hills all my adult life and been out in some very unpleasant conditions over the years, it never ceases to amaze me quite how quickly you can go from having a warm pleasant wander ….to being seriously cold ….and needing all the gear. We always tend to carry quite large and heavy rucksacks, even in the summer and sometimes when I see other folk walking along with tiny light weight bags and very little gear, I do wonder. That said however, I certainly wouldn’t be without all the gear I carry. It’s so much better to have the gear and not need it than to be caught out and get seriously cold or wet ….or worse. We wandered along the length of Craighorn before finding a sheltered spot for lunch ….and then simply retraced our steps. 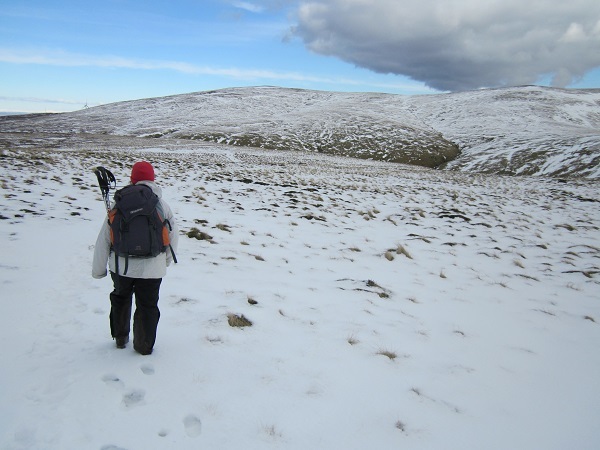 It was so beautiful and although Nita could see plenty of other walkers over on Ben Ever and Ben Cleuch, we only saw one other person…. a hill runner who was moving far too fast to get cold I guess. I really like these little hills and next time we visit we’ve promised ourselves to explore some of the many other tops and glens in the area. Anyway, they are well worth a visit, especially so on a crisp winter day.